Great Biedermeier-look doll's pram for playing or just for decoration of special collectors dolls! c..
Metal frame, rubber wheels, protective covers on the wheels & small storage box in the foot part. A .. This wonderful vintage style pram in steel-grey can be used as a toy or as a beautiful decoration it..
A nice retro-styled pram made of high quality wickerwork on a wooden box! Crocheted strips in crème ..
Beautiful pram made of wickerwork for demanding doll's mothers or as a great decoration. Soft blanke.. 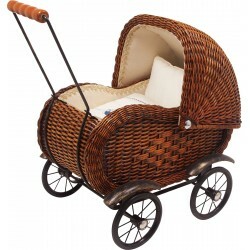 This vintage style pram is a proper outfit for little doll´s mums! The adjustable hood is made of ga.. This beautifully braided white doll´s pram is a great addition to our collection. A sunday stroll th..
Doll‘s Pram "White with Lace"
The white wickerwork basket on a metal frame with plastic wheels is an enchanting decoration and a s..
Metal frame, rubber wheels. A pram of yesteryears! A beautiful article to play with or as decoration..